Figuring out how to improve social skills in kids can be overwhelming, particularly when they have special needs. As parents, we want our children to be happy and have fulfilling relationships with their peers, but learning how to form long-lasting friendships isn’t as simple for some as it is for others. Social interaction comes easily to many of us. It’s something we inherently develop throughout our lives, and we don’t really give it a lot of thought. We know how to initiate conversations, we’re comfortable maintaining eye contact, we can read and understand nonverbal cues, and we understand what is and isn’t appropriate in different settings and situations. Making friends just comes naturally to us, and whether we choose to have a small group of close friends we hold close to the vest, or prefer to have an entire network of people we socialize with on the regular, friendships are important to our well-being. Friends understand us, celebrate with us, and offer us emotional support. Friends improve our self-esteem and make us feel like we belong. Friends help us with our emotional growth and prevent us from feeling lonely. Friends make us feel loved. And while the idea of your child growing up without the ability to make and maintain meaningful friendships can be too much to bear, there are certain things you can do as a parent to help develop their social skills. We’ve rounded up 18 social development activities for kids to teach you how to improve social skills in children with special needs. From teaching your kids about empathy and emotions to understanding their own feelings and boosting their self-esteem, these activities are perfect for emotional social development. 1. Social Skills Challenge (The Speech Bubble slp): Grab a spare cork board and put together this easy challenge to help your kids be more social. 2. Printable Empathy Game (Moments A Day): Print out these basic cards to help your child assess what other people are feeling during their interactions. 3. Emotions Discovery Bottles (Lalymom): Create these emotion bottles based on Disney’s Inside Out, and help the kids to express their emotions when they need to. 4. Social Skills Board Games (Amazon.com): Six unique board games in one box, focusing on helping kids learn about morals, manners, empathy, friendship, and emotions. 5. Self Esteem Building Dice (Kiddie Matters): A simple game you can make yourself to help your kids feel good about themselves and be more confident. 6. Printable Emotions Mix Up Game (Inspiration Made Simple): Print out and assemble this quick game which helps your kids to learn about facial expressions and meanings. 7. Mood Charades (Education.com): Write down different kinds of emotions and moods, then have the kids act them out for each other and try to guess what they are. 8. Social Problem Solving Posters (This Reading Mama): Help teach your children what to do when social activities don’t go their way. 9. Printable Inside Out Emotions Bingo (Carrie Elle): Have your children match emoji cards to their bingo cards to teach them about expression. 10. Conversation Cubes (Amazon.com): Six soft foam cubes ask 36 engaging questions to help kids get to know one another better. 11. 21 Team Building Activities for Kids (Mom Junction): A whole post dedicated to creative ways to get kids to work together on a common goal. Some GREAT ideas here. 12. Pass the Ice Cream Game (Sunny Day Family): A great sharing game based on the book, “Should I Share My Ice Cream” by Mo Willems. 13. Social Emotional Learning Games (Kiddie Matters): Three very simple printable games for kids to play, including a Positive Self Talk Shield, a Feelings Puzzle and Compliment Hearts. 14. Human Scavenger Hunt (The Science Life): A scavenger hunt that relies on getting to know new people. Who’s been out of the country? Who loves to draw? Get your kids asking questions. 15. Pom Pom Turn Taking Game (One Time Through): A great activity from the book, “101 Kids Activities That Are the Bestest Funnest Ever” by Holly Homer & Rachel Miller. 16. Good Sport Game (PBS.org): Teach your kids to be good sports while role-playing with a bean bag and a doll. 17. Kids Pocket Ungame (Amazon.com): A non-competitive game that focuses on asking questions of one another and sharing feelings, beliefs, etc. 18. Fairy Garden Role Play (Kiddie Matters): Build a fairy garden with your child, and then give them social scenarios for the fairies to act out. While it can be heart-wrenching to watch your child struggle with social interaction, educating yourself on how to improve social skills in kids can go a long way in helping your little one learn how to make meaningful friendships with his or her peers, and this collection of social development activities is a great place to start! 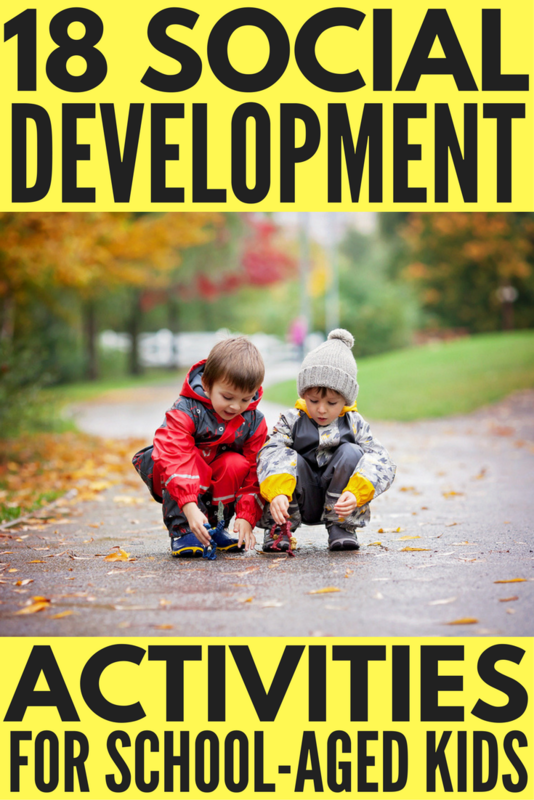 If you could this collection of social development activities to teach you how to improve social skills in kids helpful, please share it on Pinterest! And if you’re looking for more ways to have fun with your kids, please follow our Kids board on Pinterest where we share all kinds of great ideas!